Expectations, being more personal and subjective, are great to have and can keep you motivated and on track to find success in the overall accomplishments of your life. Goals are the steps that you take to get there. Goals are measurable, and are set by time constraints and ultimately should be more objective and fact based. 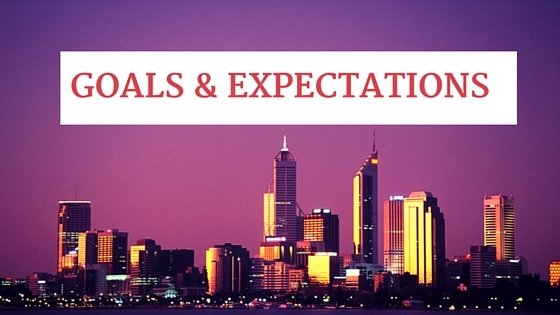 Goals are easier to keep track of and more clearly achievable when set appropriately. One way to set a goal in order to set your self up for maximum success is to make it a SMART goal. Let's create an example to show this technique clearly. An expectation could be to live a healthy lifestyle. This is a fairly broad expectation, so when we go into goal setting, we have to be able to narrow it down a bit, otherwise we may get overwhelmed and not ever know for sure if what we are doing is getting us to where we want to be. With our healthy lifestyle example we can narrow it down by saying that we would like to set a goal to lose weight. Specific- the more specific your goal is the better to follow through and know when you've met it. We want to lose weight and need to make this step more specific. We want to lose 10 pounds. This is specific in that it gives us what we want to do and exactly how much. Measurable- now we decide, can our specific aspect of the goal be measured and how? Losing 10 pounds can be measured by using a scale and seeing if there is a difference in weight. Achievable- is this something that we can achieve and how can we achieve it? If you know that you have the skill set available and that this is something you can do, this would be something you can achieve. You would also list here ways to get there. Exercising 3 days a week, eating 3 healthy meals a day, cutting out junk food. Relevant- is this goal relevant to bettering your life? Is this truly going to help you live a healthy lifestyle? This is where you justify why doing these things will get you to where you want to be. Why it is necessary to lose 10 pounds, to keep Body Mass Index (BMI) at appropriate levels. Time-This is where you add the timeframe of how long it will take to meet your goal. It is very important to be realistic here to increase your rates for success, we wouldn't say; this goal will be completed in one days' time- that's not realistic. We could say this goal will be met in 30 days time. Being specific here helps as well. This goal will be met in 30 days time, having a weekly weigh-in to track progress. Breaking any goal down like this has proven time and again to provide results. So think about your goals, how would they help you to reach your ultimate expectations and how can you achieve them to bring your life success and happiness?